In researching Quirk's painting "The Soloist" we learned that it was donated to the Georgia Museum of Art by Albert Christ-Janer. It appears that he was a well-known artist himself. This is another Harvard connection for Quirk as he exhibited a painting of another Harvard Man in Providence RI. Painter, graphic artist, writer, and teacher Albert William Christ-Janer was born in Appleton, Minnesota. He studied at the Art Institute of Chicago, Yale University, and Harvard University. Christ-Janer wrote about American artists Boardman Robinson and John Caleb Bingham, and taught at a variety of institutions, including Stephens College, Cranbrook Academy, Pratt Institute Art School, and the University of Georgia. He was also an artist-in-residence at Tamarind Lithography Workshop in 1972. An avid printmaker, Christ-Janer developed personal working methods that often involved a good deal of risk and uncertainty. Through his experimentations he created a range of tones and textures that deepen and enliven his abstract forms. Nature was always his starting point, and he once stated, "The earth, sky, and the sea are my sources of information; art is my inspiration." 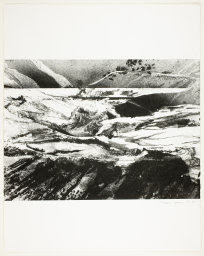 Work by Albert Christ-Janner Landforms GA 11, n.d Lithograph on Paper Courtesy of the Art Institue of Chicago. He taught at the University of Georgia during the last three years of his life. After his death the created a major award in his honor. Janner also was affiliated with Penn State and designed a noteworthy house to live in. Below are some excerpts from a web-site discussing the house. Albert Christ-Janer was Dean of Arts and Architecture at Penn State. A brother was an architect of some note (who said that the secret to success as an architect was to marry a wealthy woman). Architecture historian Richard Porter recalls that at the time of completion, the house was the most discussed in town and guests to parties there thought that if they ever had a house like this, they would have truly "arrived." Also the furnishings included that icon of the period, an Eames lounge chair, as well as other noted mid-century modern pieces and appropriate large art works. The front entry to the house is directly behind the chimney. The entry is located midway between the two levels of the main house wing. Notice the dramatic use of natural lighting and the compression-expansion technique so prized by Wright. These are pictures of the window wall of the great room Looking out per the photo, one has the feeling of being in a secluded woods. This is quite amazing considering that the two adjacent houses are quite close by. These photos are details of the window wall of the great room. While in-room closet space is generous, storage for out-of-season items is scarce. If you look carefully at the base of the window wall, you can see that the inside flooring stops short and flagstone is to both sides of the glass to enhance the feeling of being outdoors. The main entry way can be seen in the upper center of the right photo. The dining area of the great room is tucked dramatically under a balcony room. Live trailing ivy grows from planters in the dividing wall above. The side of the house has no desirable view (in fact, the reverse is true), so the full length windows are semi-opaque to hide the outside while letting natural light flow in. Sadly, Christ-Janer died in an auto crash near Como, Italy during a 4 month stay there. He was only 63. There is a scholarship awarded each year in his honor.